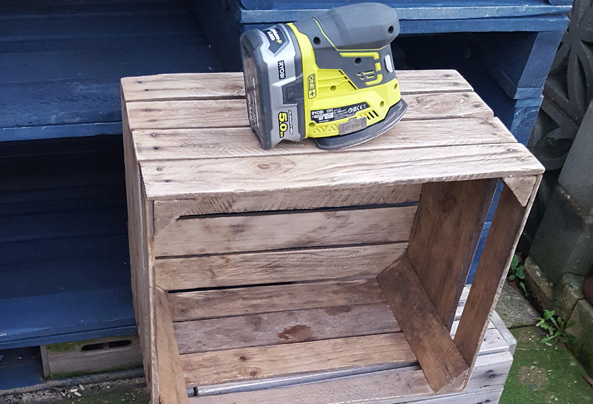 Last year I purchased a couple of apple crates with the plan to make a coffee table that I'd seen on several upcycle pages. But Halloween happened and one my crates played host to our pumpkin spoils, and then went up in the loft with all the decorations! I've decided to scrap the coffee table idea and used my other crate as a storage unit for my son's toys. This one will be located in the conservatory, mainly because it goes with the decor out there. 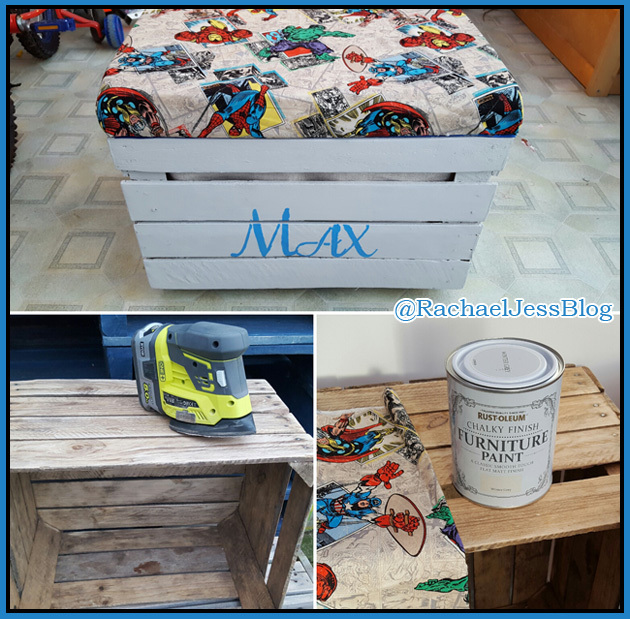 My crate very much needed sanding down, especially as this was going to be for my son, I needed to make sure there were no splinters or sharp edges which is where my Ryobi Sander came in. Once the crate was smooth, I decided to paint it. 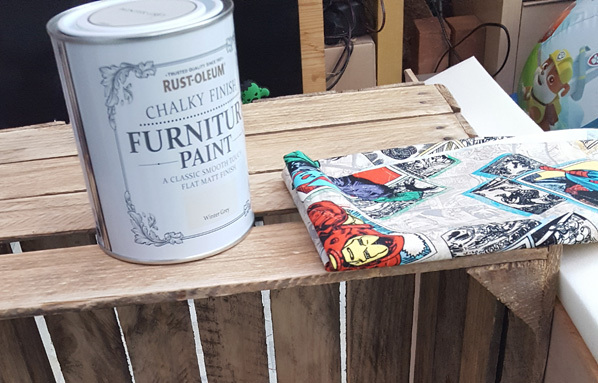 I wasn't going to, but to be honest, I'm not a big fan of natural wood colouring in the home, so I used my Winter Grey from Rust-Oleum, as I feel it went best with the material I had chosen. 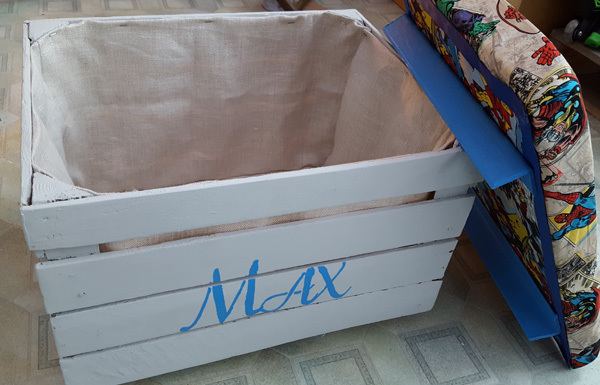 Whilst the paint was drying, I worked on making a lid for my crate. I wanted something simple, no hinges this time, a straightforward piece of MDF cut to size with a foam topping. 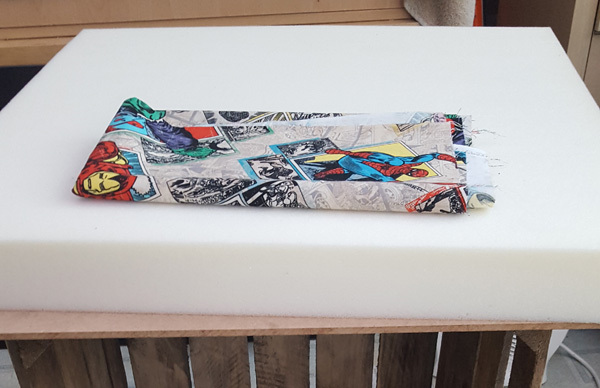 I usually purchase my foam from eBay, you can find almost the right size you need on there and at a very reasonable price too. My fabric also came from eBay, but there are several sites that have some wonderful pieces such as Frumble where I've purchased several geeky pieces in the past. I added some wood to the underneath of the lid to give it some stability when resting on the crate, and that was the lid done, and I'm rather happy with that. The crate needed legs though. 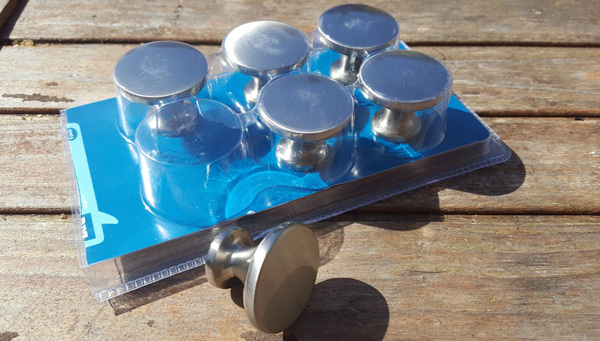 I went rummaging in the garage, house and charity shops but found nothing that really suited the crate, and then I found some great little knobs when I was in B&Q (for a totally unrelated project), and these are perfect! 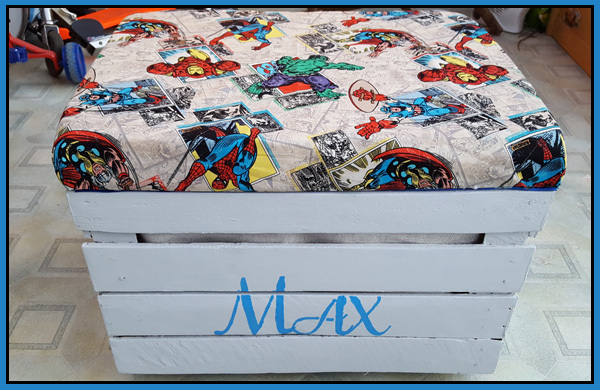 What I did notice with the crate is how the slats left rather large gaps, so for some crazy reason, I decided to add some material (sewn no less, people! I very nearly lost it with the sewing machine!) inside to keep the smaller of toys and 'bits and bobs' safe. - My most challenging moment! Finally, my crate is complete. It's taken a long time to do, but as with all my projects, I have to fit them in a very busy home, but it's my chill out therapy (except the sewing, we don't talk about that!). I did get to a stage where I was really beginning to dislike my project, but that's not unusual for me to feel this way because they take me so long to complete. But now it's done, and my son loves it, I'm rather proud of it again. I do love these crates, so versatile. I love the coffee table too but I fear the crates will never make it.